Last year, we had a large group of mid-distance specialists eager to push themselves at some of the biggest meets of the season and as time went on, as they got the attention of more guys in the community, their training started to target middle distances at some of the biggest meets of the season. Jacob Lewis (Boulder Creek, 2018) was the first to drop below 4:20 at Brophy AMDG Invite. Meanwhile, Leo Daschbach (Highland, So.) had put his name on the radar since winning the AIA Cross-Country State Championships as a sophomore, but only time would tell just how fast he would be. He ran his first sub-4:20 mile at Chandler Rotary followed by Lewis, and then Desert Vista's Habtamu Cheney (Sr.) and Aksel Laudon (Sr.) also under the 4:20 mark, though they were eager to see much further they could push themselves. At the Arcadia Invitational, Laudon ran a school record of 4:17.63 to place 3rd in the One-Mile race followed by Cheney in 4:18.94. In the same weekend back at home, Daschbach lowered his 1600m best time to 4:14.77 at the Sun Angel Classic. Everything would culminate at the AIA Track and Field State Meet, which would prove to be one of the fastest in State history with record performances dropping like pins in a bowling alley. 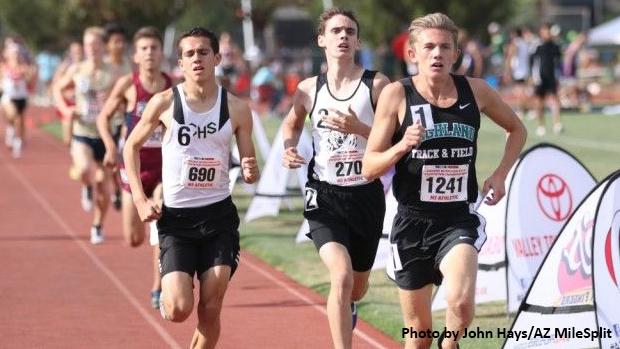 Finally, it was time for the top milers in Arizona to toe the line for the 1600m with several guys looking to give Daschbach and Jacob Lewis a run for their money. First up was the D2 Boys 1600m race, in which Rylan Stubbs (Campo Verde, Jr.) blazed a new PR of 4:15.71 and led Tony Mar-Y-El Torres (Ironwood Ridge, 2018) Matthew Bradley (Prescott, 2018) and Randy Espinoza (Deer Valley, Fr.) under 4:19. Then in the D1 Boys race, Lewis remained true to his style opening with a 60-second first lap. Daschbach reeled him in over the next two laps and with powered through the finish to edge out Lewis in 4:10.6 to 4:11.5. Thomas Cain (Cibola, 2018) finished 3rd in 4:13.88 followed by Habs Cheney in 4:15.09 to round out the podium spots. Anthony Haren (Perry, 2018) and Aksel Laudon also finished under 4:20, making it a total of ten boys that ran sub-4:20 at the State Championships that afternoon. The way each of these guys locked on to their respective targets and gave everything they had to chasing running down elite performances makes this our No. 4 Story of 2018.